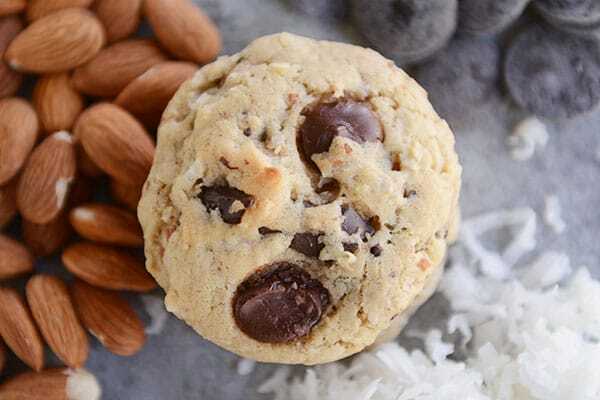 All the flavors of a classic Almond Joy candy bar (dark chocolate, coconut and almonds) rolled up in deliciously soft, Almond Joy chocolate chip cookies! 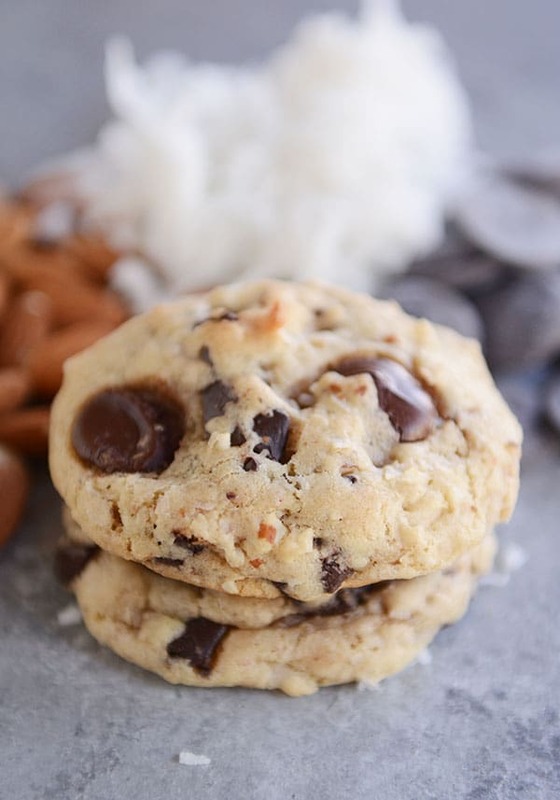 Coming from a girl who’s normally like “get out of my cookie, all nuts forevermore,” I always feel a bit of a who am I and how did I get here sensation when I make these delectable cookies and can’t stop eating them. 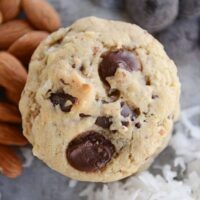 Loaded with all the flavors of an almond joy candy bar (but a million times better because the ingredients are fresh), these soft and delicious cookies are simply amazing. You want to know the slightly embarrassing thing about these cookies, though? I made them years ago when I was living in Minnesota. My sweet friend, Bonnie, wanted an almond joy-esque cookie to make for her husband who loves all those flavors. 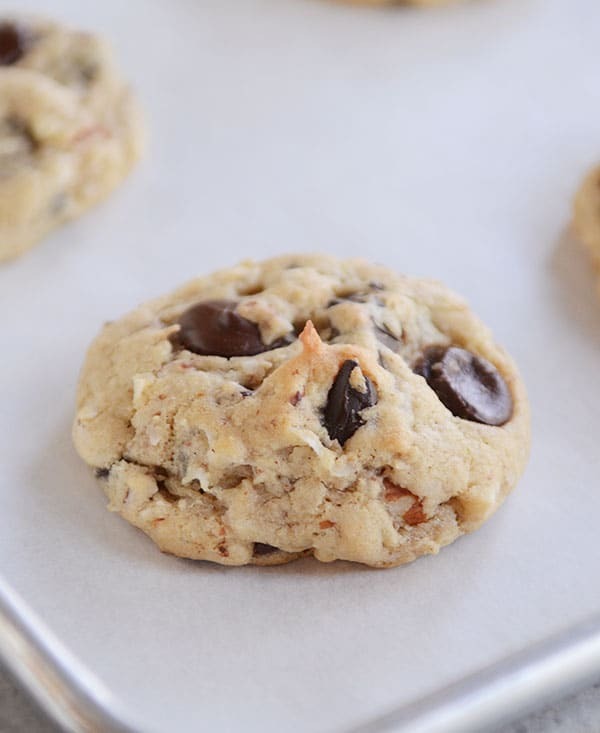 We came up with this cookie, made them lots of times, and everyone loved and devoured them. Ahem, particularly me. And then I moved to Idaho and completely forgot about them. Seriously. I don’t know what happened, but in that chaotic vortex of moving (if you’ve moved across the country, or let’s be serious, even next door, you know the swirly confusion and mess of moving I’m talking about), they were stripped from my cookie-loving memory. I honestly had no recollection of them for years. And yes, this has planted a deep seed of fear in my heart about what other recipes I may be forgetting. A couple weeks ago late one night, Bonnie’s teenage daughter, Leah, texted me a picture of some amazing cookies she had just made. I immediately texted back: SEND ME THAT RECIPE! She sent a very puzzled response asking if I was joking and then nicely let me know I was slightly crazy since I was the one who gave her family the recipe. All this time, she figured I was making them weekly, just like she and her mom. Oops. Friends have been lost over similar scenarios. Needless to say, by 8:30 a.m. the next morning, Almond Joy Chocolate Chip Cookies were made and cooling on my counter. I proceeded to eat my body weight in tasty, irresistible cookies in order to rekindle my love. If you want to take them up a further notch, toast those almonds. And for a slightly less puffy cookie, simply omit 1/4 cup of the flour or so. 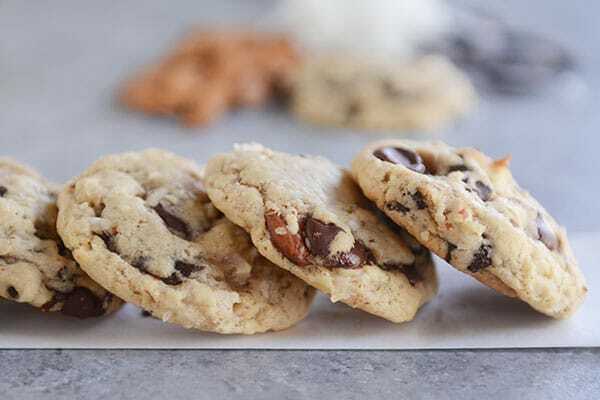 Honestly, these almond joy chocolate chip cookies are perfect for those who love a cookie with a lot going on. The chocolate, almond, coconut flavor combo was destined for a cookie; I’m so happy they are back in my life. And this time, for good! Preheat the oven to 350 degrees F. Line cookie sheets with parchment paper, silpat liners or lightly grease with cooking spray. Set aside. In a large bowl with a handheld electric mixer (or in the bowl of a stand mixer fitted with the paddle attachment), beat together the butter, brown sugar and granulated sugar until smooth, 1-2 minutes. Add the eggs and vanilla and beat until the mixture is very light in color, 2-3 minutes. Add the flour, baking powder, baking soda, and salt. Mix on low speed until just combined (it's ok if there are dry streaks remaining). Stir in the chocolate chips, coconut, and almonds by hand until combined. Drop by rounded tablespoonfuls (I use a #40 cookie scoop which is about 2 tablespoons) onto the prepared baking sheets, spacing the cookies a couple inches apart. Bake for 10-12 minutes. Remove the cookies to a wire rack to cool completely. I like these cookies just ever so slightly puffy. If you want them a bit flatter, cut the flour down to 4 cups instead of 4 1/4 cups. Just like most drop cookies, these babies freeze great (baked or unbaked). This is my new favorite cookie!! Every bit as wonderful as you declared them to be! I’m amazed at the difference the almonds make to the taste……thanks for a new favorite! These have a wonderful flavor and texture. I think next time I make them I will decrease the flour, as per your instructions. Thanks so much! Made these today and brought them to a friend’s pizza party. Every last one of them was gone when I left. Thanks for another fantastic recipe, Mel!! Mine aren’t as pretty, but oh my! That are delicious! Thank you for once again giving me a recipe to love. The combination of flavors is superb. Do you toast the almonds before or after you chop them? Either works, but I usually do it after I chop. I’m not a big chocolate chip cookie fan, but these are amazing! The coarsely chopped toasted almonds really send them to the next level, and they’re sturdy enough to throw in a baggy and pop in a daypack. We took some on a 38 mile bike ride yesterday, and the two that weren’t consumed along the way, came home none worse for the wear. Thanks for another wonderful recipe!! These are addictive – made them all and stashed them in the freezer for upcoming guests. Hi Mel! I made these and do love them…but I want to try them with more chocolate….like Cocoa powder. Could you give me a recommendation of where to start? Add 1/2c. of unsweetened cocoa powder and reduce the flour to 3 3/4??? I made these yesterday and have to say they are crazy mind blowing delicious ! Truly the best chocolate chip cookie I’ve eaten in a long time. The texture and flavors, to me are spot on .Thanks for another excellent recipe ! These are AMAZING. 1/2 teaspoon of almond extract made these babies sing! These cookies are the only thing I want to eat for the next week. Hi! I was thinking a cup of sugar weighed 7oz, which would make 1 1/4 c. 8.75oz. This recipe says 9.5oz. Am I mistaking in what a cup weighs? I love that you put the weight of the measurements. I’ve been converting my other recipes. Thanks!!! I toasted the almonds as well as the coconut and these turned out so flavorful. I am not a cookie dough eater, but this cookie dough was just as good as the cookies I think! I baked mine for 10 or so minutes and they were burnt. Next time used dough from the fridge and checked them at 8 and 9 minutes and took them out and they were great. I’ll have to change the time in my recipe – nothing worse than a well browned cookie! I will be keeping this recipe in my favorites pile. It’s a winner! And I love that it makes a ton. So excited to try these Mel! Thank you!! Love coconut and chocolate!! These look delightful!! Can’t wait to try them! Thanks, Mel! P.S. This is the second recipe that won’t go to print when I click on your print icon. Just in case something is wrong on your end?? Hey Janet – do you use Internet Explorer as your browser? If so, you might need to switch to Firefox, Chrome or Safari. For some reason IE has issues with printing. Thank you, I love the flavors, will definitely try these. I only buy sliced almonds, but they should be fine in this recipe!! Just made these and LOVE them. Thanks for another great recipe! These just jumped to the top of the to-do list for today. These look yummy! I can’t wait to try them. Thank you!! These look delish! One more question- do you adjust the sugar when using sweetened/unsweetened coconut? I think what I’m really asking is- which do you generally use? 🙂 Thank you- I looove coconut & chocolate! Thank you! That’s what I have on hand… I guess it was meant to be. These may magically appear on my kitchen counter tomorrow morning as well! Quick question- I have slivered almonds on hand, do you think these will work instead of chopped? I’d definitely try the slivered almonds before going to the store just for whole almonds! If you use them, I’d probably omit the chopping step so you get a little crunch from the tiny slivers.